Good food, good cheer, good neighbors –and many new faces! 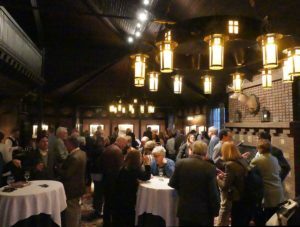 A happy evening to welcome Spring and launch a new season for Albany’s Washington Park was enjoyed by all at the Conservancy’s Annual Meeting on March 20. In addition to many Conservancy members, neighbors and friends, numerous elected officials were in attendance at the event, including Hon. Mayor Kathy Sheehan, Assemblyperson Pat Fahy, and City Councilman Richard Conti. Outgoing President Erik Kulleseid also introduced Sergio Panunzio, the new Commissioner of the Department of General Services for the City of Albany and the newest Park stakeholder, who briefly addressed the gathering. Sergio is a certified Public Works Manager and came to Albany with more than 32 years of experience in public works in northern New Jersey. New officers and board members for the Washington Park Conservancy were introduced at the gathering. New board President Daniel McEneny succeeds outgoing President Erik Kulleseid. Marcia Moss will continue for another year as Vice President. Sarah Read is the Conservancy’s new Secretary, and Doug Ebersman will serve another year as Treasurer. New directors joining the board for their first term include: Nicki Brown, Joseph Giovannetti, Stacey Stump, and Michaela Sweeney. Moving from the Board of Directors to the Advisory Committee are Wint Aldrich, Jeffrey Gordon, and Erik Kulleseid. And former board member John McClennan is also joining the Advisory Committee. Read more HERE about the members of the Conservancy Board, and HERE about members of the Advisory Committee.